Manufacturer of a wide range of products which include food retort pouches. High Retort (Under 125 C) High Barrier (OTR, MVTR) Non-Microwaveable Food Retort Pouches can be used for the packing of any type of food, which needs long shelf life in room temperature. Concept of retort pouches is pretty much the same with cans. Normal retort process is 123 Celsius for 30 minutes which is called high retort. They can be made in different shapes like stand up pouch (shelf stable), 3side sealed pouch and spout pouch. Recently, institutional pouches are extremely used in seafood industry. Purity Flex provides best quality retort pouches, which are characterized by excellent sealing capability, high temperature sterilization, lower OTR, WTR and longer shelf life. These pouches can be laminated as per customers' requirements, which provide better barriers against moisture, humidity and puncturing. To glamorize the look of these pouches, we use gravure printing in 8 eye feasting colors. Microwavable pouches are advanced version of regular retort pouches. Because of being very convenient to use, microwavable pouches started to replace retort pouch lately. Microwavable pouches do not contain aluminum and barrier comes from special polyester film. Normally, microwavable pouches come in the shape of stand up pouches, as end user wants to put pouch into the microwave and eat right out of the pouch. Our microwavable pouches conform all the parameters of quality and designs to provide the customers zero defect and high quality pouches. 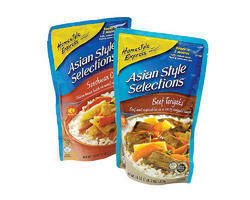 They can be used for packing seafood, stew, meat, curry, rice and other processed foods. Looking for Retort Pouches ?